Your generosity is vital to our success. For Walden School to continue to fulfill its mission of providing an outstanding educational experience to our students, we must continue to evolve and adapt to new trends in education. Campus 2025 is the vision of our future and it's largely the support of our community that will help us achieve our goals. Please make a pledge today to support our Capital Campaign and assist in building a better Walden. We did it. The NEW library and music Hall is here! Thank you to our generous community for donating to the Capital Campaign, helping us reach our Fund-A-Need goal, and providing gifts to us in so many other supportive ways. The beautiful learning space will open its doors to a new chapter in Walden education. We couldn’t have done it without you! August 25, 2017 - Campus 2025 went public with the inaugural celebration of the first phase: a new library! Students eagerly participated in the presentation of the conceptual construction space that will one day be a full-fledged Library Media Center, offering technological resources and multitudinous literature for all students to enjoy. July 27, 2018 - guests were invited to the first groundbreaking ceremony for the Library Media Center and Music Hall. With the architectural layout in place, several donors, faculty, alumnus and even a young student (sporting hardhats and wielding golden shovels) were the first to break ground for the momentous occasion. Construction for Campus 2025 has begun! September 14, 2018 - Mind the construction! Amidst the backdrop of the annual, festive Thoreau Down event (featuring a chili cook-off and the Alumni Association Drum Award presentation) a public groundbreaking was held for the Walden community. The churned earth for the ceremony seemed small compared to the massive mounds of tilled ground in the actual construction zone. The building progress over the summer was transformative! October 5, 2018 - With the buildings quickly taking form, procuring new furniture for the facilities was a topical focus of the 2018 Fund-A-Need campaign. In conjunction with the 30th annual Walden Auction, Paris Under the Stars, fundraising for modern furnishings in the library, music hall, and new lobbies kicked into top gear, utilizing the marketing attraction of Auction spokesman, Le Davie. Thanks to the generous support of the community, the Fund-A-Need raised $42,000 of its $66,000 goal. October 22, 2018 - Walden students, faculty and staff, and Capital Campaign donors were invited to leave their mark for the commemoration of the buildings set to open their doors in early 2019. Two of the beams were painted white and by the end of the week, a complex mosaic of black Sharpie signatures lay resplendent across their surfaces. Ribbon Cutting - March 2, 2019! Open the doors and cut the ribbon! The new library media center and music hall are officially opening on March 2, 2019. Everyone is invited to attend this momentous occasion, celebrating new facilities that expand both the campus and educational opportunities for our students. What’s next? A NEW SOCCER FIELD! More details about this amazing addition to our campus coming soon. The Walden athletics department and student athletes couldn’t be more thrilled. Go Wolverines! Walden School publicly announced Brooks Bower as the Chair of Walden’s Capital Campaign on Saturday, May 20th at Soldier’s Retreat - the home of Marilyn and Brooks Bower. The Bower Family has a long history with the school; with three graduates, two current students and an incoming Kindergartner, Mr. Bower has a strong interest and is highly invested in the future of Walden School. There are six phases to be completed in this campaign. 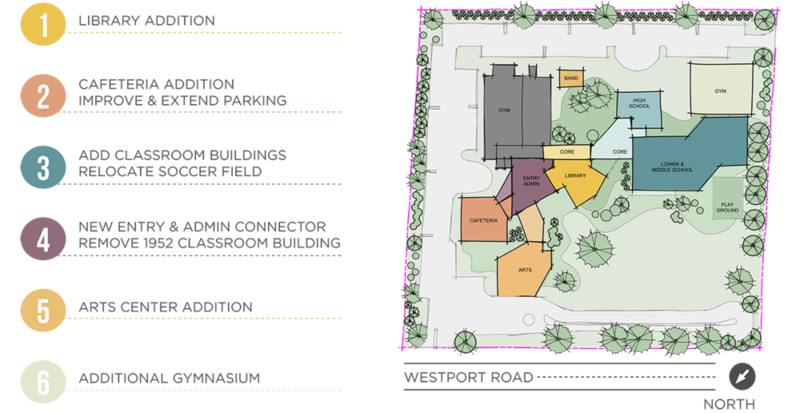 Over the next eight years, Campus 2025 will transform the Walden School campus on Westport Road. The priorities of the campaign will include a new library and cafeteria addition, new classroom buildings for all three divisions, relocation of the soccer field to the Bower Athletic Track and Field, a new entry and administrative connector, an additional gymnasium and a new arts building. Phase One of Campus 2025 is the building of a new library and media center which is well underway of reaching its goal of $1,600,000. While this plan aims to modernize the educational infrastructure of Walden School, the administration remains steadfastly committed to maintaining their core values: Curiosity, Creativity, Respect and Responsibility.